The United States has among the highest costs in the world for knee replacement surgery. An American with no health insurance can expect to pay $45,000 – $70,000 at a typical hospital. Those with insurance will, barring a few exceptions, be covered by their provider. However, out-of-pocket expenses can still be costly for those who have health insurance. Patients with medicare are eligible for knee replacement surgery. Total knee replacement surgery—also known as knee arthroplasty—is a procedure performed when a patient’s knee has degraded to the point where it no longer functions or causes severe pain. Usually, knee replacement surgery is necessary for patients who suffer from severe osteoarthritis and have impeded mobility. When determined to be necessary by a doctor, knee replacement surgery is usually covered by a patient’s health insurance. Most health plans cover any necessary surgery, including orthopedic surgery, as long as it is not specifically excluded (as is common in the case of weight loss procedures). For patients on Medicare, knee replacement cost is usually covered. However, this may depend on your individual condition, and you may be subject to additional fees. Patients should always contact their provider for coverage information. What should be included in the cost? Prior to surgery, your orthopedic surgeon should carry out an evaluation of your knee’s present strength and range of motion, and make the determination of whether total knee replacement surgery is the best course of action. If your surgeon decides to proceed with the operation, there are a number of services that should be included in the cost. Anesthesia, perhaps the most important part of any surgical procedure, is included in the cost at almost every hospital. 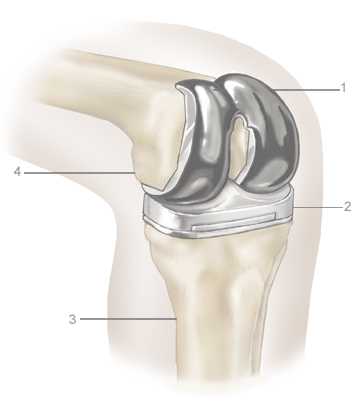 For total knee replacement, general or epidural anesthesia is usually required. While you are under anesthesia, the orthopedic surgeon will remove your damaged bone and cartilage, and insert artificial joint surfaces made of plastic and metal. The cost of the knee replacement device itself will also be included in the total cost of your surgery. There are a number of different knee replacement device manufacturers, with different products used depending on the hospital and your particular condition. Two of the more common device manufacturers are Zimmer and Stryker. After surgery, you will be required to stay in the hospital for several days for initial recovery from your knee replacement. Your hospital bill may or may not include the cost of preliminary physical therapy and rehabilitation sessions. After knee replacement surgery, patients start on the road to rehabilitation. Following the procedure, you will be required to undergo physical therapy to regain the strength in your newly-repaired leg. Some preparations can be made to speed this process along. First of all, some additions to your living space can be made to ensure your comfort during recovery. These include toilet seat risers, safety bars, a shower bench, and even a modified first-floor living area to eliminate the need for stairs. For patients with insurance, physical therapy costs are often covered. Usually patients will have to complete several weeks of physical therapy sessions following a knee replacement. It’s always advisable to enter this stage of your recovery with an open mind and a positive attitude: after all, your recovery depends on you, and the mobility that you regain is directly related to the effort you put into your rehab. Finally, depending on your lifestyle, your knee replacement device may need to be replaced later in life. The lifespan of current knee replacements can range from 10 to 15 years, to even longer. Remember to always notify your doctor if you experience uncharacteristic discomfort or limited mobility, as it these may be indicators of a complication with your knee replacement. Knee replacement complications can include infection (which occurs in less than two percent of surgeries), complications from anesthesia (rarely including heart attack or stroke), and other issues. All material on this page is for informational purposes only and should not be construed as medical advice. Always consult your physician or pharmacist regarding medications or medical procedures. For American patients without health insurance, it is worth considering medical tourism – leaving the country for knee replacement surgery. Many countries in the world offer this procedure for costs dramatically lower than those in the United States. We have listed knee replacement cost estimates from various medical tourism destinations in the chart below. The cost of total knee replacement surgery will also vary from patient to patient, depending on factors such as age and medical history. medication, operating room fee, x-rays, and consulation.